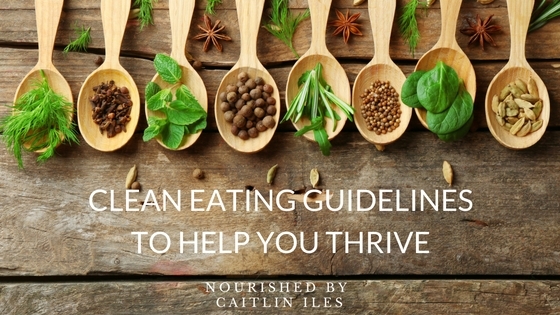 Clean Eating Guidelines to Help You Thrive! Making healthy changes doesn’t happen overnight, so be patient and treat yourself with loving kindness as you progress. It’s important to be gentle as you make dietary changes because these changes can have a tremendous impact on the way you feel on a daily basis. It’s likely that you have been eating and thinking about food a certain way for decades. It can take a lot of concerted time and effort to overthrow negative thought patterns and incorporate healthy changes into your life. What you eat if you’re trying to build muscle is different from what you eat if you’re trying to lose weight, which is also different from what you would eat if you’re trying to heal a digestive tract. Find out what is most important to you and then figure out the foods that will help support you as you work towards your goal. You can chat with me if you need some guidance! Food that is grown locally is typically more nutritious and has less of an environmental impact because it hasn’t been shipped from all over the world to get to your plate. Go to your local farmers’ market and make new friends. Find out how your food is grown and support the people who are taking steps to save our planet. Both help support local growers and foster a sense of community, which contributes to your health on a whole other level! Eating the same thing day after day is boring. You can easily change up your staples by incorporating various herbs and spices into your repertoire. As a bonus most herbs and spices offer potent anti-inflammatory and antioxidant benefits. You can read all about some of my favourite herb & spice combos here! If the junk isn’t there you’ll be less likely to eat it. If the good stuff is there you’ll be more likely to eat that instead. Easy peasy! 8. Make Healthy Eating Fun! Don’t eat things you absolutely hate because you think that they’re good for you. That kind of negative energy will impact how you digest and assimilate the food. Find something with similar benefits that you actually enjoy and swap it out! Most tap water is full of chlorine and fluoride, neither of which help build health in the body. You are made up of 70% water, so choose filtered & mineralized water to build the healthiest body possible. Many people are chronically dehydrated so ensuring that you’re drinking enough water keeps your cells and kidneys happy, your skin glowing, and can help keep you energized. Add a pinch of sea salt and a squeeze of lemon to your water for extra minerally goodness! Visit the EWGs Dirty Dozen and Clean 15 for the most & least sprayed produce and purchase according to your budget. Check out this 1 minute video to see how swapping out all their conventional food for organic impacted the toxin levels in these kids! Figure out which whole foods work for you and which don’t. Beans make me feel terrible, while grassfed beef makes me feel like I can take on the world. The opposite may be true for you, so experiment until you find what works. Fresh Fruits and Veggies: Every colour represents a different antioxidant and they all help fight free radical damage in the body and send the signal that all is well. So make sure to eat the rainbow! Cocoa or raw cacao: Chocolate is not bad for you. Processed chocolate full of junk oils and sugars is bad for you. Indulge in fair trade, raw cacao-based treats or make some of these treats. Read more about them here, here, & here. Combine beans, lentils, and grains to form complete amino acid profiles. Incorporate moderate amounts of pastured meat, wild game, free-range poultry, & organic dairy (if tolerated) into your meals. Nuts & seeds are a great option for protein rich snacks on the go. The most important part of a healthy diet is that you are eating foods that agree with your body and make you feel alive and vibrant. What may be healthy for one person could make another person feel very ill. Figuring out what works for you body, your biochemistry, and your belief system requires mindfulness and the ability to listen to the signals that your body gives you. It is so important not to let a specific diet or ideology define you to the point where you are suffering due to your belief system. Some people may thrive on a vegan diet, while their best friend may end up with a host of hormonal issues. In the same vein some people do very well with moderate amounts of animal proteins, while the same amount could make their friend feel sluggish and heavy. Your body is wise beyond measure and will certainly point you in the right direction if you sit down and listen to what she or he has to say. Remember that what your body requires will likely change from year to year, season to season, and even day to day based upon your stress & activity levels, whether you’re pregnant or nursing, the climate you live in, and even the foods that are available to you. If you enjoyed this series and want to dive deeper into it make sure you download my FREE Stop Self-Sabotage Workbook by clicking here.